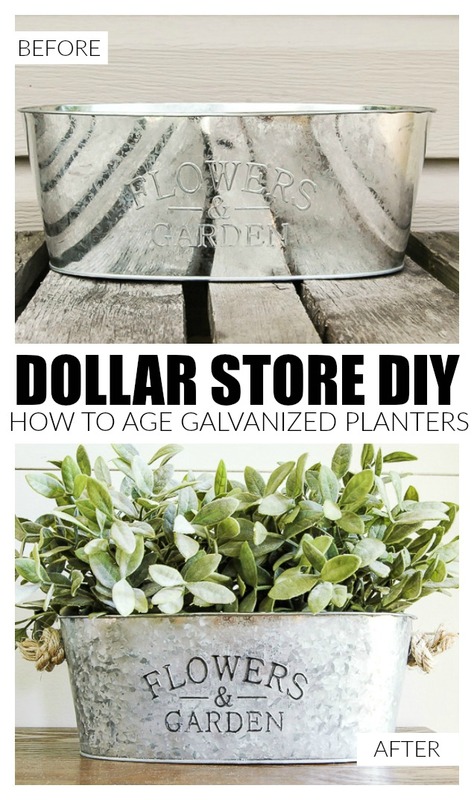 How to age galvanized Dollar Tree planters with a few simple household ingredients! 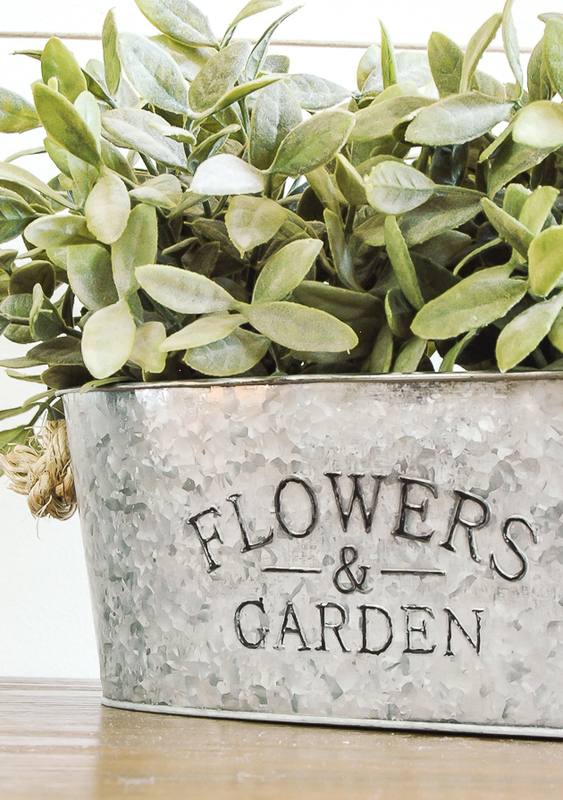 Did you know you can easily age new shiny galvanized metal in just a few simple steps? There's no need to wait for weather and time to do the job for you. 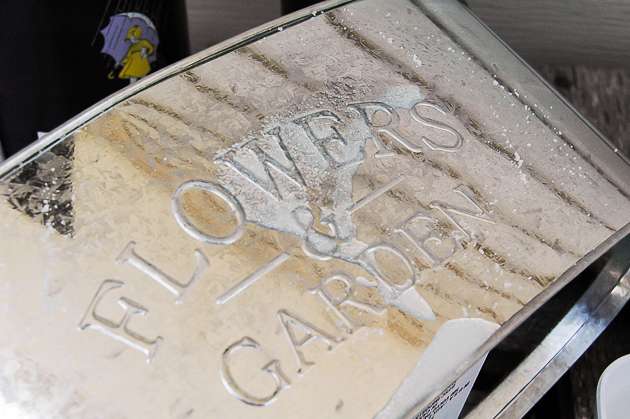 Aging metal is easier than you might think and doesn't require harsh chemicals. 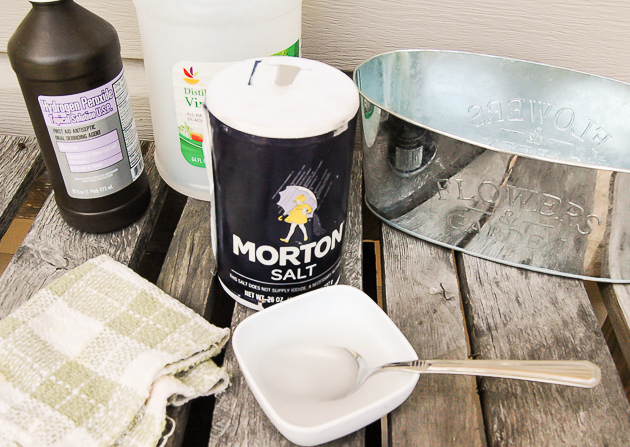 Three common household ingredients and a little elbow grease are all you need to perfectly age and weather galvainzed metal, tin and other similar products. 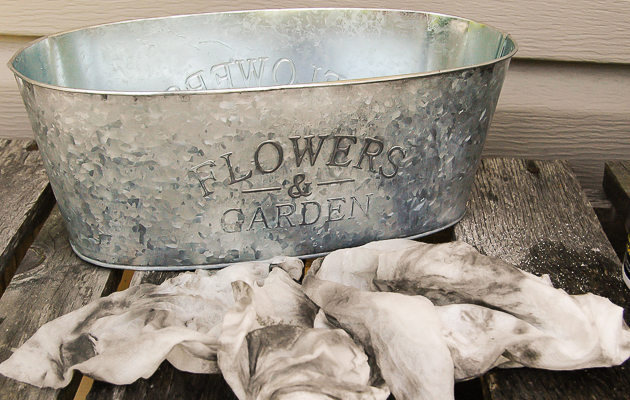 I've been wanting to try aging metal myself, so when I found a shiny metal bucket at my local Dollar Tree I knew right away it would be perfect for aging. 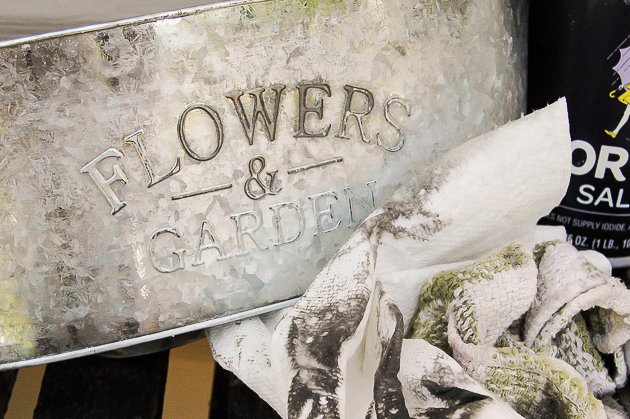 I'm pretty sure this metal bucket isn't galvanized, but this method of aging metal will work regardless. 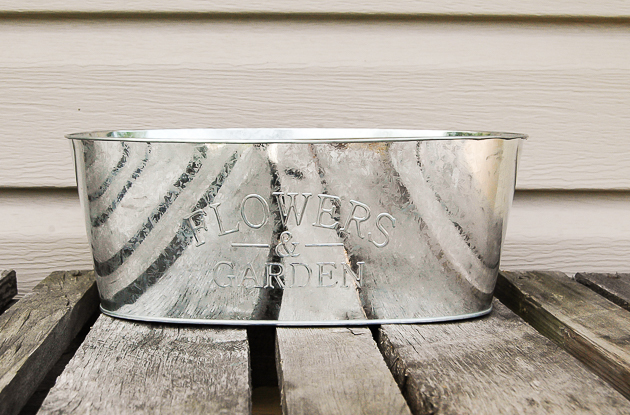 I started with this shiny metal "Flowers & Garden" planter that I found in the garden section at Dollar Tree. They must be pretty popular because when I went back to take a picture they were all gone! I'm not really surprised since they are a great find for a dollar. 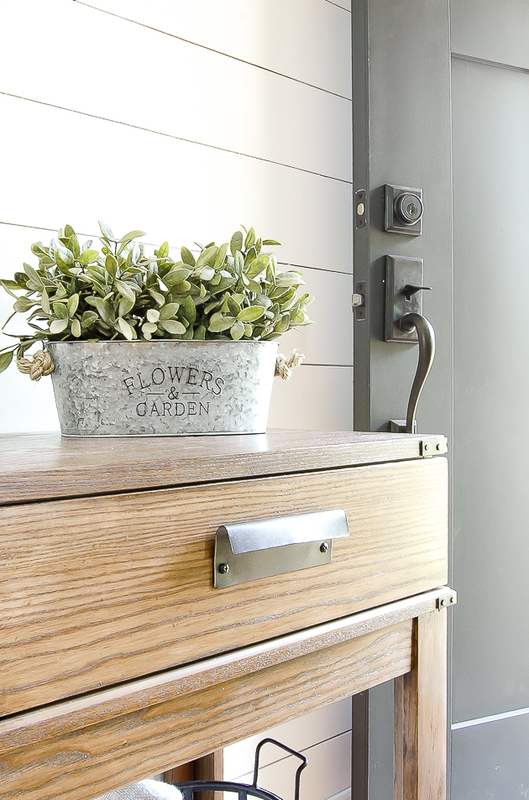 The planter could definitely be used as is, but I really wanted to age the metal to make it look a little weathered and rustic. I did a some research and found that three common household ingredients can be used to easily age metal. 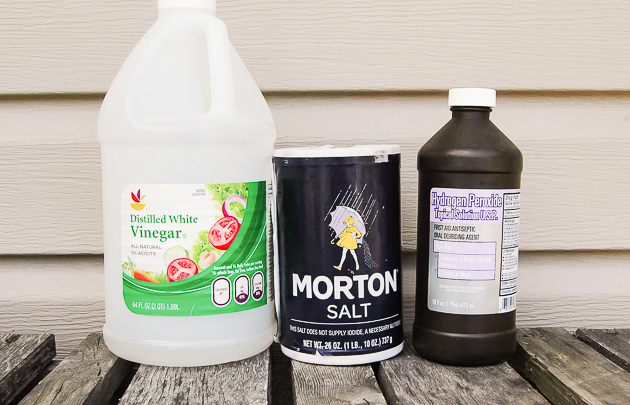 Vinegar, salt and hydrogen peroxide. I used a spoon to pour a bit of the mixture over the metal, (making sure to get some of the salt to use as an abrasive) let it sit for a while then used an old rag and paper towels to rub the mixture into the planter. I repeated the steps a few times until I was happy with how the metal was aged. I found the longer I let the mixture sit on the metal the better the aging results I achieved. 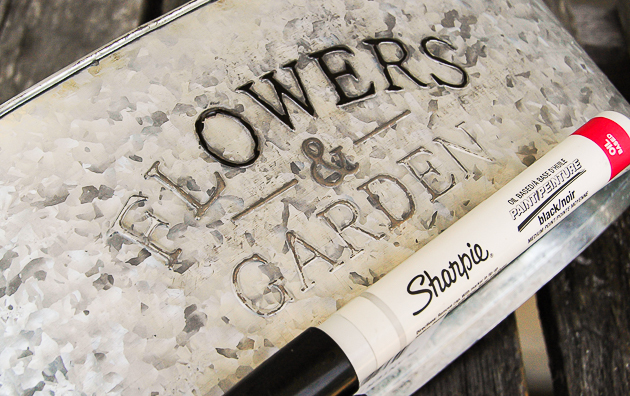 To add a little depth to the metal planter, I highlighted the letters by tracing them with an oil-based permanent marker. I then used a paper towel to rub off some of the marker to give the letters a worn look. You can stop here or if you want to go one step further you can add rope knots to each side of the planter. 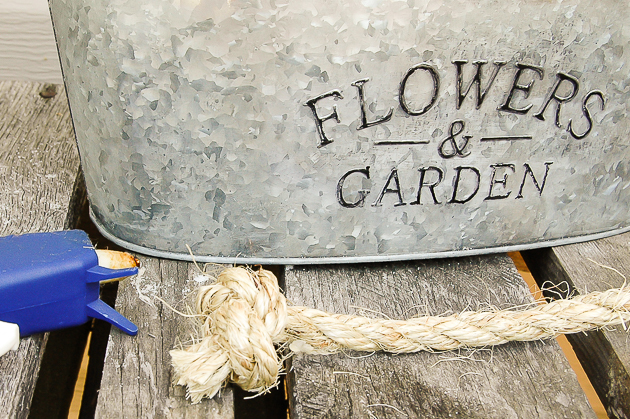 I simply knotted one end of my rope, cut the other side close to my knot then hot glued a knot to each side of my planter. 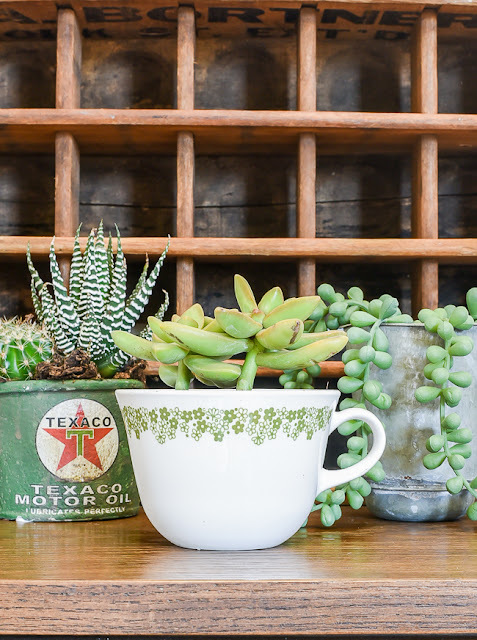 The addition of two faux greenery plants completed the project and I had a perfect aged metal planter that only costs a dollar! 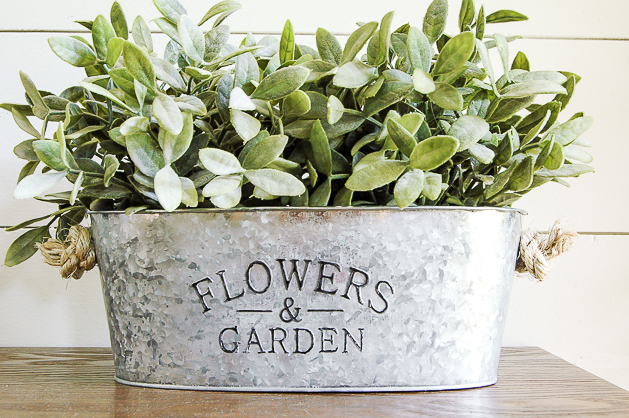 It's hard to believe this shiny metal planter was originally purchased at Dollar Tree! 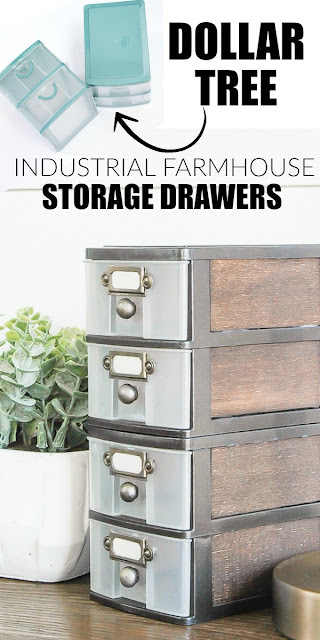 Now when you see shiny metal bins and planters at your local Dollar Store or Target's Dollar Spot you can easily turn them into the perfect aged and weathered decor! 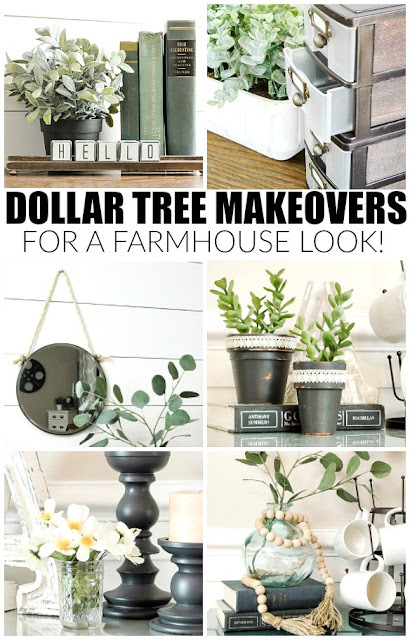 Click HERE for more Dollar Store DIY projects. Running out to dollar tree now! That is a fantastic look! I just did the same thing after reading this! LOL! I just bought 3 galvanize buckets for my daughters grad party and have been trying to figure out how to age them...you saved the day! Thank you! I like what you did with yours. I painted mine a taupe gray shade and added dark wax. I also used a black Sharpie for the lettering. I love this! I have a shiny metal milk can from the dollar spot at Target and I can't wait to "age" it now. I followed your directions exactly on a sheet of galvanized metal to age it. It did not work. Looking at your pictures it looks like the metal is not true galvanized metal. So I'm going to try it on a cheap metal tin i have. Unfortunately the salt just scratched my metal which was not a great aesthetic. Oh no! Did you let the mixture sit on the metal for a bit? I had to repeat the steps a few times before it started rubbing off. Good luck! 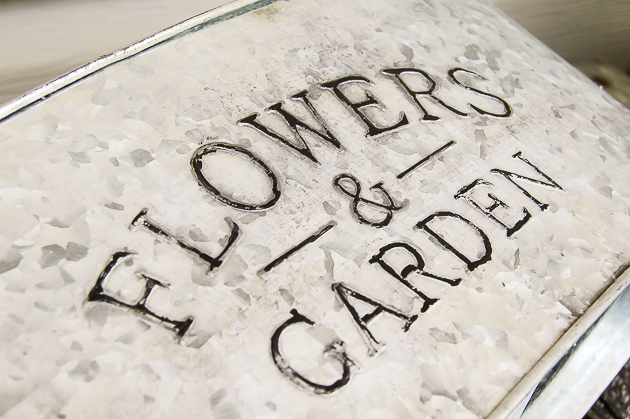 It's easier to work with a flat piece of galvanized metal. The trick is to leave the solution on for a long time (a day at least). Also, try adding Comet powder to the solution. 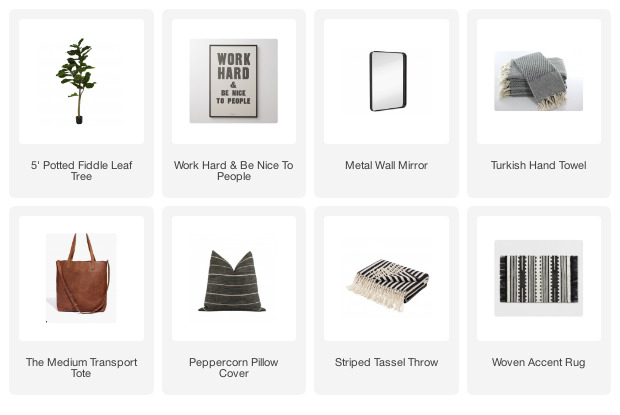 Enjoyed this post as this blog provided me nice info about Metal supply.Thanks for sharing it. Excellent, beautiful, fantastic, gorgeous. Do you get how much I love this post? 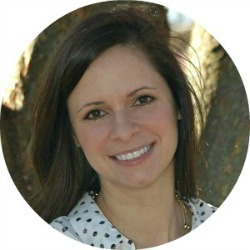 You did it girl! Wow!!!!!!!!!!!!! I have never seen any containers like that, or any other galvanized pieces at our local Dollar stores. Lucky you! I just bought 3 of the exact ones in my local dollar tree. They did not have them last week. They may be coming to your location soon! You can also age metal(especially aluminum) by running it through the dishwasher. Repeat until you get desired effect. This is awesome! I tried painting items to make them look more rustic but did not love the outcome. I love this! Thanks for sharing! 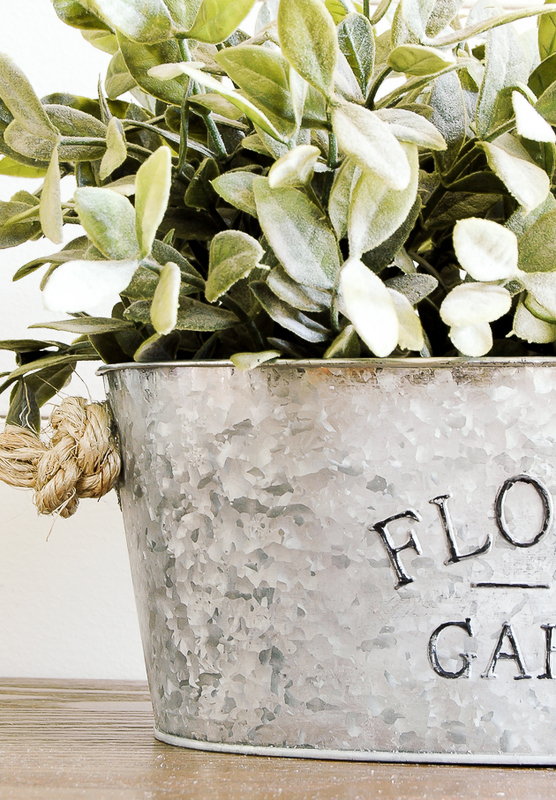 Where did your greenery come from? Thanks. This is exactly what I needed to age a piece of galvanized sheet metal for a bulletin board! Thank you!